KANSAS CITY, Kan. — The Missouri State Highway Patrol and the Kansas Highway Patrol have teamed up for the 16th annual Michael Newton toy drive. The toy drive is named after Michael Newton, an MSHP trooper who was killed in 2003. For the past 16 years, troopers on both sides of the state line have come together to bring Christmas gifts to children who are in the hospital. On Friday, troopers spent some time with young patients at the University of Kansas Health System. "We know that what they’re going through is very difficult and what their family is going through is very difficult so we want to be able to spread a little bit of joy during his time," MSHP Sgt. Bill Lowe said. 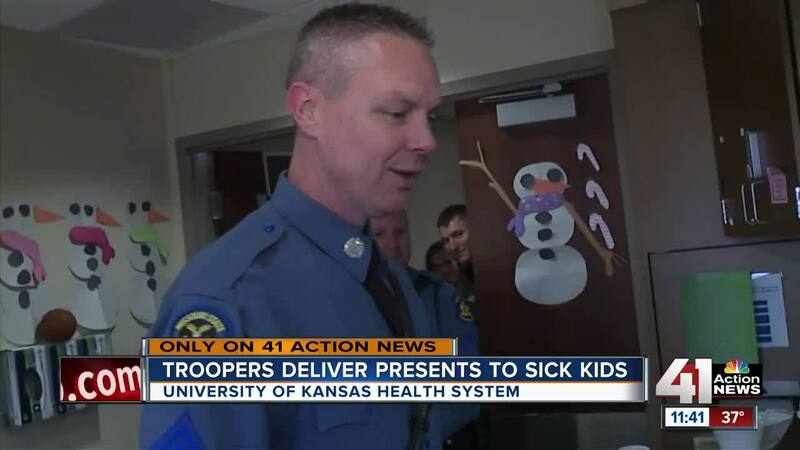 "When people are in the hospital during the holidays, it might bring you down a little bit, so bringing these toys and their families just helps us to spread a little holiday cheer," KHP Trooper, Candice Breshears said. Troopers say they had to bring in a U-Haul for all the gifts, and say the toy drive gets larger and larger thanks to the amount of donations received.